Crudes prices are down roughly .5% this morning to $48.90, as markets are losing enthusiasm from the post-Harvey recovery. 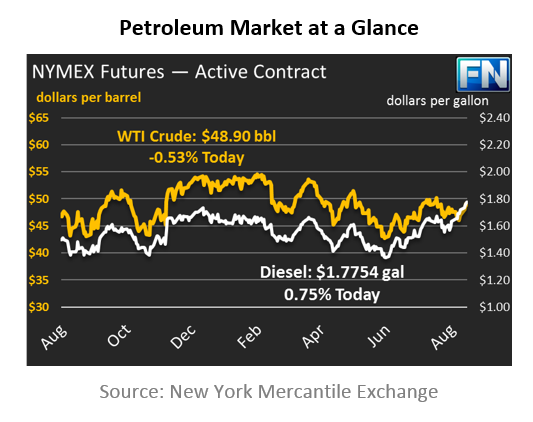 While much crude refining remains offline, markets appear to believe that production will normalize by the time October’s future month contract comes due. Refined product prices traded mostly flat for most of the morning, but have seen rapid gains later in the morning that helped bring them to their current levels. Diesel prices are $1.7754, up 1.59 cents (.9%) from yesterday’s close. Prices have risen for the past three trading sessions in a row, continuing to put pressure on diesel consumers. Prices gained two cents yesterday to end the day at $1.7595. Gasoline prices are also up, trading at $1.6894, a nearly 1% gain since yesterday. Gasoline prices fell yesterday by roughly a penny. Gasoline prices have fallen for four straight trading sessions, falling from a lofty $2.14 level down to $1.67. Today it appears gasoline is turning around and heading to higher ground, along with diesel. Gas prices in the Southeast remain elevated, though they are slowly beginning to normalize. Gulf Coast gasoline basis is trading today at +14 cents (over NYMEX prices), down from the high of +32 cents but still well above the traditional range (-5 to -1 cents) it typically trades in. Gulf Cost diesel basis remain around +3 cents, compared to the -4 cents it traded at before Harvey. EIA inventory data has been delayed and will be reporting today, though few expect the data to have a major impact on market prices. The API reported yesterday that crude stocks built by 2.8 million barrels (MMbbls), while gasoline and diesel cumulatively fell by 3.1 MMbbls. Inventory data will be significantly affected by the storm for the next couple weeks, so markets are unlikely to find new information there. With refineries offline, significantly less crude has been consumed and less refined products are being made.